Blogging is a buzz word in the small and medium business community. Almost every client we talk with (or potential client) wants to know how to do a blog because they have “heard” it will help their search engine rankings. This falls into the tradition of small business owners being about 8 years behind on new marketing tactics. That’s not a criticism, it’s a reality. Most small business owners don’t have the hours in a day needed to stay on top of anything besides what they do. The Bad News. Although there is clearly some truth left in that assumption that a blog will help your sites rankings, but, and it’s a big but, if you are to see an increase in your sites popularity based on a blog, it must have valuable content that other sites and social media will pick up on and mention. If your blog is just another 700 + words of regurgitated news, facts, rumors, or opinion already published or blogged about on the Internet by 100 or 1000 other sites your chances of a web master or influential social media picking up on the blog are very low. And if your Blog isn’t mentioned on other web sites, it gets no help in rankings. Additional Value of a Blog bedside’s Rankings. Now, if your blog gives your prospective clients or current customers some unique insight into your business or industry, even if they are not going to mention it or link to it, it’s still of value, just not for your search engine visibility. It will help you become more of a trusted source for whatever it is you do. Internet Marketers Are Blog Obsessed. That’s a problem, because many (and I mean many) Internet Marketers have had some success with getting their blog or content mentioned and linked to, (and all that SEO stuff), by writing a blog,. 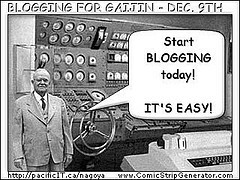 They write blogs about blogs that are based on another blog in the hopes that someone they don’t know, and who is trying to get followers on twitter will retweet their content to an audience that has little or no interest in what they are saying, and have already seen the information 5 times in other higher authority blogs or sites. The reason they have any success is it’s far more likely to get Internet Marketing content linked or mentioned on the INTERNET because Internet Marketers spend half their life reading this stuff. 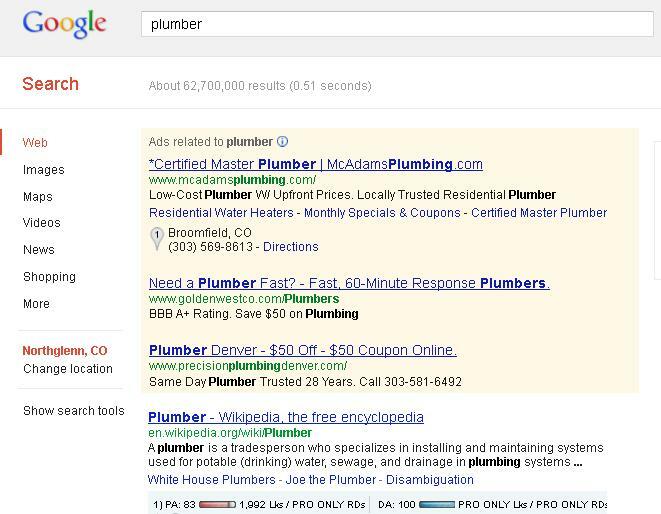 If you are a Plumber, or a Dentist, the likelihood of having your content picked up is very small. Plumbers and Dentists, and normal people don’t spend their life on-line reading every blog written, even when its content is the same as the last 5 they read. It’s important for an Internet Marketer to be up to date on all the new stuff on the Interweb, if for no other reason, so they can sound really knowledgeable and use uncommon words when they speak to Plumbers and Dentists. I call it selling through a vernacular fear factor. More on that some other time. Blogging For Visibility. So how does a small business utilize a blog for better Internet visibility? It’s all about the subject and content. Blog about a question a customer asked you. Blog about a unique problem you solved. Blog about how a person can prepare for your service. All of the above will at a minimum be unique, and unique is the first principle of good content. Any content you write and publish should have these attributes. And if you can make it about the internet you’re really doing well. We think the new rankings algorithm is based on Supervised Learning and raw statistical analysis that Google uses. The change is probably simple, and frankly very logical. I have two blogs listed at the end of this article you can read for more and better detailed information. Before the panda and penguin updates at Google It was too easy to use on site tactics ( Keywords and H1 Tags and meta titles) to influence rankings. Google is now moving too, and undoubtedly is using more off site context, and content to determine what your site should rank for. To do that they probably look at all the “citations” (mentions) for your site, in what ever format they appear, and have a raw statistical analysis of the relevancy, and then the context. You say your site is about Insurance. You get credit for the three, and how much credit would depend on the Authority of the page and site you are listed on. One of the interesting consequences of all this is the no follow or follow link value disappears. As many “citations” may not have a link to your site. A Citation or link is only going to help you if it comes from a site or page that Google see’s as relevant to your site.That’s one reason your rankings dropped off the face of the earth if you where primarily using non relevant sites. Follow or not, a high authority site citation with a link or without is still good for your sites Authority, and ranking. On site signals continue to be important, but they only point Google in a direction to determine your sites Authority theywon’t help your ranking on their own. url is (Project Type) in (City). We added it to 4 or 5 sites that were related directly to Remodeling. We may have tweeted it, and added it to a facebook comment. Two months later it was ranked number 1 for that very specific keyword, and on the first page for that keyword phrase in different form. It was (and is) ranking higher than several sites that have been around for a long time and had SEO companies working on for years (at least to an extent). We originally thought the the exact match domain for local sites was still a very important ranking factor and it was that simple. Now, I think if we had back linked the same 2 page site to 4 or 5 unrelated directories… or sites, that it would have never been ranked. Well, only one way to find out. Check back in a few months. We will give you an up date. “act as if Google doesn’t exist” principle in SEO for years (to the extent any Internet marketing company like My One Call LLC can). Our clients didn’t see any rankings drop over the last 6 months based on these new changes. I also mentioned the SEOmoz blog on Co-citations on an early blog. http://www.seomoz.org/blog/prediction-anchor-text-is-dying-and-will-be-replaced-by-cocitation-whiteboard-friday . Google’s Top Down Search Navigation Is A Big problem For Local Businesses. Google, tell me you’re joking! Most Local SEO’s know the challenges that can come from Google serving up the wrong location results on local searches. In MANY cases Google is showing the searcher results (Maps and other) from towns or cities several cities away from the searchers town. The solution has been for the searcher to find the “location” box and type in their city or zip. In my very informal survey about 35% of the people I asked had no idea how to do this, even before the new Google search options bar changes. Here is what the new Search Options (on top) bar looks like. Notice any thing missing? In this case Google Thinks I am in Erie . 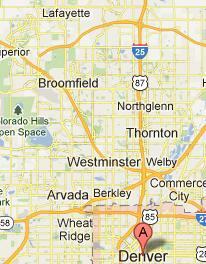 Some times Google thinks I am in Thornton CO. and sometimes other suburbs I rarely visit. I am in Lafayette CO. So, where is the location box? You have to click on the “search tools” Tab to find it. How many searches will actually find the location tab, I haven’t a clue. I suspect, that if Google doesn’t move the tab to the first line on the main bar were it is visible we will continue to see local results (especially in suburbs) served up incorrectly. Seems like an easy fix, just have a little statement on top for searches that Google perceives a local intent, saying “We think you are in _____ < location. If not type your zip code here. Here is what it looks like once you click on Search Tools. So, what’s the solution if your business or client is in a city that has this issue? Use organic optimization and visibility programs, and Ad Words. Yes, I said Ad words. It’s increasingly becoming (for a local company) an important piece of catching all the traffic for your client. Of the 4 ways a person can make a local search (keyword no local intent, keyword with major city, Keyword with actually city, keyword with zip) The new Google Search Tool Bar has an effect on 50% of those. Tell us what you see in your area. If your clients or business (and their prospects) are based in a major metropolitan area (example Chicago, or Phoenix) then this isn’t going to be a big deal. If your business needs to be visible to prospects primarily within the city you serve (example Broomfield CO.) this is a big deal, and you will need a strategy to work with each of the local search types we defined above. Do Top Google Local Rankings Equal High Sales For Small Business? Do Top Google Local Rankings Equal High Sales? As a business development firm as well as a Denver SEO we get to look at all sorts of data. One of the reports we run shows all of the Denver Metro Area construction permits issued over a period of time. We use this to help guide marketing efforts for clients. 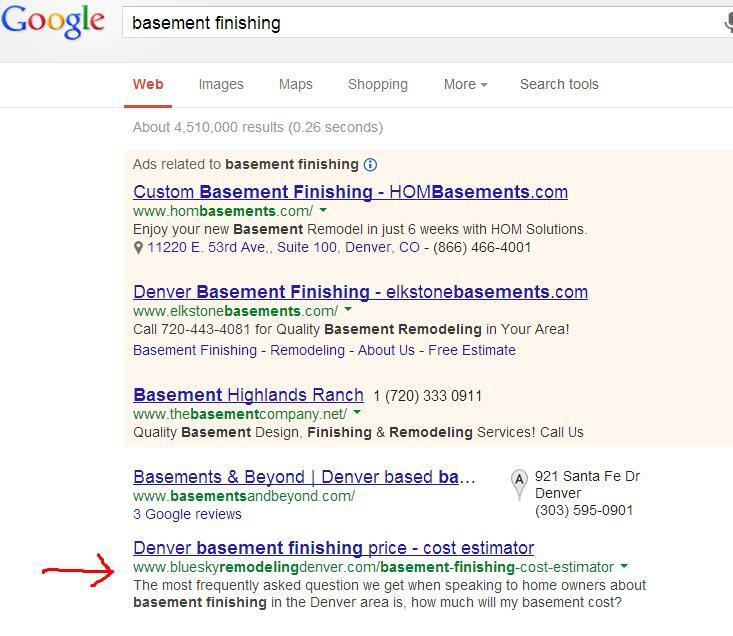 I thought it would be interesting to compare the top ranked basement finishing companies on Google to the rankings of basement finishing companies by number of sales in Denver over the last three months. If top Google rankings for important (highly searched) keywords are valuable in selling more, then they should show up very high on number of basements sold. “Denver Basement Finishing”. We are not looking at location based searches and rankings, like setting our browser to a suburb and searching “basement finishing”. We can however with relative confidence say that the top ranked sites we see are very well ranked in the other search types for local. Those being: just the keyword, keyword plus suburb, keyword + zip. How does this stack up to the number of Permits issued for basement finishing in the Denver Metro Area from June 1st, 2012 through 8-20-12? 3.) Tie. Finished Basement Company 05 and two others. (The Basement Company and RS Master Builders). There are 258 total basement Permits listed from Contractors. These three companies sold 31 of those or 12% of the total. There are 174 different contractors on the report, these three only represent 1.7 % of all the companies on the report. The average contractor sold 1.4 basements. 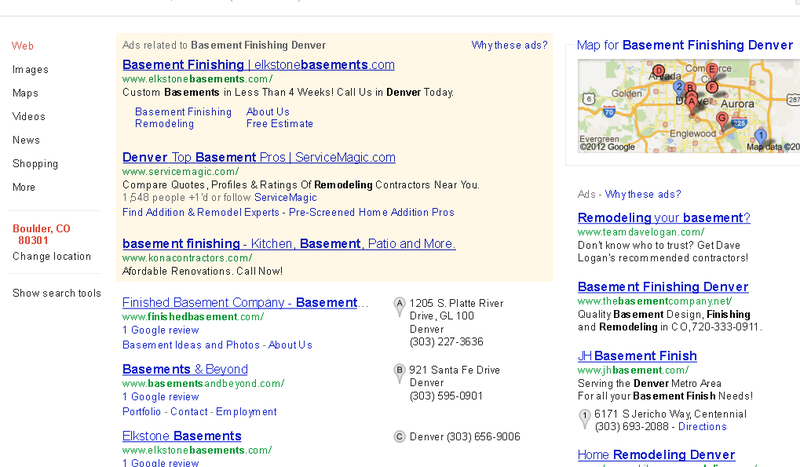 The top three in the Google results sold an average of 9.7 basements. That is 7 times as many as the average. It also is noteworthy that Elkstone Basements (a client) does Pay Per Click on Google. We didn’t see the other top two in the Pay Per Click ads. There are many other factors that could influence a basement finishing company’s sales. Some of those being other marketing they do, number of referrals they receive, competitiveness of their pricing, their sales process, and people just seeing their trucks! 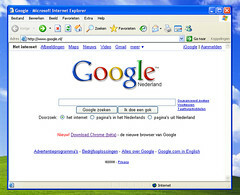 But there is no question there is a very strong relationship between high Google Rankings and High Sales. A note on the data: We removed home builders who had a basement permit, as these appear to be new construction sales and not in the same category as the others. Wouldn’t it be great if we had access to this type information for all types of business? We could make a strong case that web visibility provides a very strong return on investment, and in the world of SEO and Marketing, that is a case we are consistently trying to make. Feel free to call me if we can help you with your Business development. 303 500 3053 . We work with Contractors, SEO’s, Web Design Firms, and Just about every type small company you can imagine!